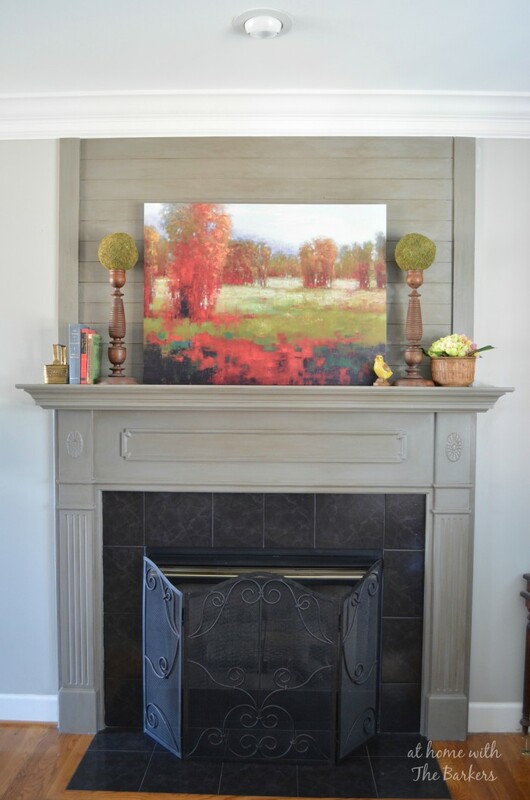 When I decided to do a makeover on my mantel, I knew I wanted a paint that I could wax over for an aged look. This would be the perfect time to try a homemade chalk finish paint. I have used a few different brands of chalk type paint however they are really expensive! Since I already had the paint I needed leftover from painting my dining room I was ready to go. All I needed to do was make the homemade chalk finish paint consistency I needed. I had heard that Plaster of Paris was the product I needed. So with a little testing, I came up with the right mixture. 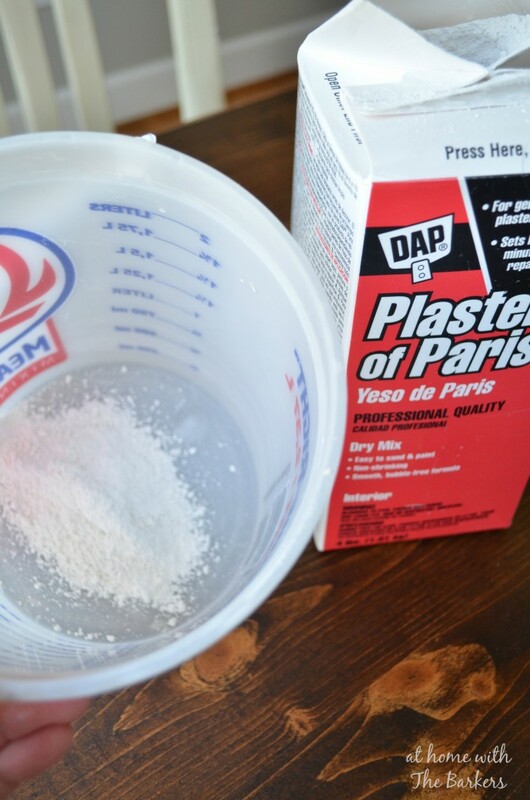 You can purchase the plaster of paris from any home improvement store. I bought mine at Lowe’s and it will last me for a while. If you can see this box holds 4lbs. You can also grab it from Amazon through the Prime service for a great deal! See this awesome post for best ways to shop Amazon. 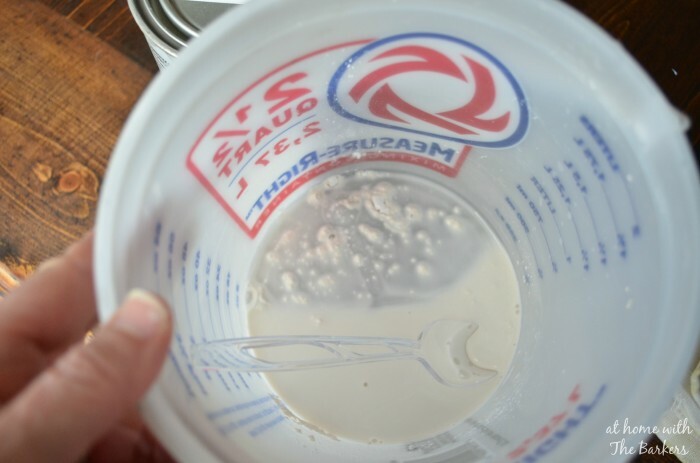 Mix the Plaster of Paris with the cool water. It will have lumps so make sure you stir until they are all gone. It will be the consistency of skim milk. Add the latex paint. Again, mix together until completely combined. This made plenty of paint for my mantel. I could have actually cut the recipe in half and still had enough paint for this project. I decided to use the Annie Sloan wax that I already had at home. The paint went on really smooth and I was very pleased with the outcome. It waxed just the same as any of the other chalk like paint products I had used previous. Sealing chalk paint is a must though or you will get stains. 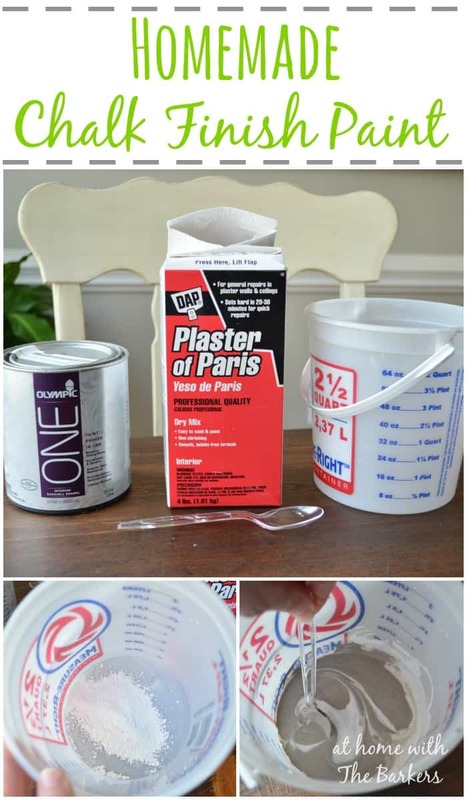 I have already used this formula for another paint project! 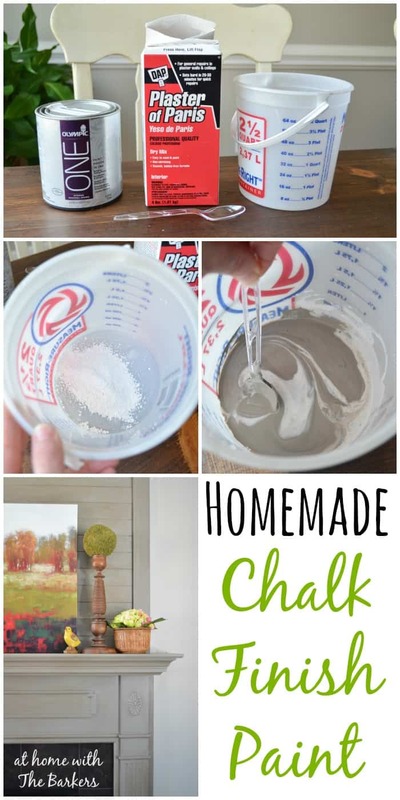 I highly recommend it as a cost effective way of making your own homemade chalk finish paint. Additionally, you aren’t limited to the paint color options the other brands offer. Visit the Mantel Makeover for a full tutorial on how to make your own wood plank mantel. I also painted these topiary pots and this black bedroom set with the homemade chalk finish paint. I’d love to hear your experience with chalk finish paint of any kind…so please share in the comments! **There are affiliate links in this post. This does not mean you pay a dime more when you purchase a product through my link. It just means I made it easier for you to find something, so I make a few cents when you purchase it. I so appreciate your support of At Home with The Barkers! Thanks for showing us how to make chalk paint. At $40 a quart, it’s hard to justify buying a certain color that one might need for a small project. Now I can make my own and save a ton of money! Thanks for the instructions! Thanks Paula! I really do like having cost effective options! 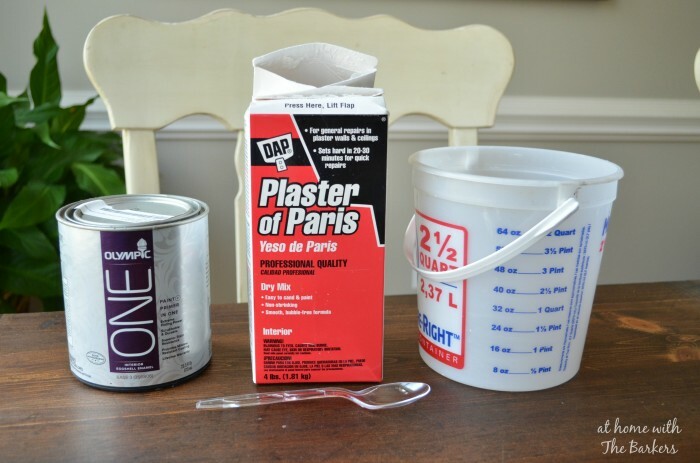 When I mixed plaster of Paris with water and paint it was gritty.what did I do wrong? You can also use calcium carbonate, I buy it at Amazon. It’s a smoother finish. It is the primer in the paint you mixed it with. It is a beautiful color! It is a Sherwin Williams color called Gauntlet Gray but I had it mixed at Lowe’s in the Olympic One. I tried doing chalkboard paint a little while ago and it failed horribly, lol. I used non-sanded tile grout. I’ll have to try it your way. I love it! I love hearing about people’s success stories with homemade chalk paint because it takes away some of the anxiety I have about trying it. I have an old bedroom set that has seen better days but the detailing is gorgeous so I’m thinking some chalk paint is exactly what it needs. Your mantle turned out amazingly well! Love it! Thank you so much! Sounds like this would be a great option for your bedroom furniture! Mine was not thin but you can add a little more of the latex paint to it until it is the consistency you like! FYI, I usually ad some water to my chalk paint for the second coat to thin it down because it covers really well! I tried making my own chalk paint for a recent project. Total failure. I think I had the proportions way off. I will definitely try it again, though, and follow your recipe! Thanks for sharing … the fireplace looks fantastic! Thanks Lani! It really was cost effective and super great to work with! Wow, that’s awesome! Your mantel looks incredible. I’ll have to give this a try! Thank you for showing us all making our own chalk paint is a good idea, much more versatile and cost saving. If I could only buy the commercially made chalk paint I’d never get to use it. Not everybody can afford the fancy stuff. I’ve made some of my own chalk paint with other ingredients and it worked quite well. I used what I had on hand since we don’t live close to a store for supplies. When I get the urge I want to be able to go for it then. I’ve yet to use plaster of paris but have heard it works better than other ingredients. Glad you told us about this and showed us. Think one of those mixing cups you used would be handy also. Happy Spring days. I saved this so I can print it out, want to do it right when time comes. Love homemade DIY and your chalk-y paint recipe! Thanks Sonya! I have painted all kinds of surfaces with Chalk finish paint. You can use what ever wax you prefer. I plan on trying the Minwax one soon. Did you have to do any special prepping of the surface before using your paint, or could you paint it right onto the surface like commercial chalk paint? Love you project… looks wonderful! I am going to try your chalk paint recipe and was wondering if you need to use a special type of paint… like flat as opposed to semi gloss or satin? I happened to have this paint on hand and it was in an egg shell finish and it worked fine but if you are going to have to go buy it I would just get flat because after you miss the plaster in it’s chalk like anyway. You said you used paint left over from your dining room. When you mixed it with plaster of Paris and water, would you say that the colour was lighter than the original paint colour? When making the chalk paint it will likely look lighter but usually darkens back up once waxed. I will say, be sure to mix enough paint the first time or you could get a slight variation of color. I painted the desk I was talking about, used Annie Sloan paint and wax, yikes expensive but wanted to se the real dal for first project. I had to use two coats to cover it and I really should of used three! Not real happy with the outcome though. Hmmmm wonder if I did something wrong. Depending on the color of ASCP and the amount of distressing I plan to do to a piece I have painted multiple coats. BUT I have always been pleased with the outcome. Did you distress and what wax did you use, clear or dark? I used Old White I think it was called and AS clear wax. I am taking a class on her paints etc. next week so maybe I will pick up some tips and my next piece will come out nicer. Thanks for this recipe. I used it on two bar stools with Valspar’s Nautical Sea (dark teal) and have been very happy. A few questions though- do you get tiny flecks of white in your paint? VERY tiny? It didn’t matter on this project, but I am not sure if I would like that on everything. Is that normal to have them? Also, how much sanding did you do afterward since it has a bit of a gritty texture? I have never used to “real deal” chalk paint before and this is my first project with it. MANY more to come! LOVE it. Thanks! So glad you tried it Holly! I did not have any white in mine but the key is to make sure to mix the plaster VERY well with the water first before you add it to the paint! Yes, also chalk paint has a semi rough surface and becomes smooth with waxing. I used Annie Sloan because I already had it. This is an awesome recipe! Just tried it this past weekend and it was such a super fast and easy project. I purchased an Ikea Vittsjo coffee table (2 nesting black and glass tables) that only comes in black. I have been in a spring makeover mood, so after our purchase of a new grey couch, I added some lovely blue-green pillows and wanted the table to match. I did a little shopping and found just the right colors. Took about 3 hours to paint the tables in complementary colors and I couldn’t be happier! Still have to wax, but that’s for this weekend. I am amazed by how great the finish looks even before the wax, and how easy it was to work with. Loved how fast it dried, but I did get stuck with one or two drip spots I didn’t catch in time to get rid of. Oh well – they’ll go on the side not seen as much! I will post pictures once the waxing is finished. Thanks again for such an easy project! Thank you SO much for sharing this with me and all my readers! Sounds like you are on a roll with your decorating! Thank you for the step-by-step instructions + “recipe” + name of the color you used. I recently painted a cabinet with DIY chalk paint but used 1 cup of paint + 1/2 cup Plaster of Paris + 1/2 water. I am pleased with the results but will use your formula for future projects. Some of the areas on the cabinet dried lighter than others and I needed to touch them up so the color would be uniform so I think your formula would work better. Thanks again. Your mantel turned out nicely! Can’t wait to try this recipe. Just wondering what is the brush stroke you used? The tutorial on ascp she recommend a special brush stroke style. And what type of brush did you use or recommend, I will be painting my kitchen table. I used a regular 2 inch slanted paint brush for this piece but I have used the dry brush technique before. It is a special brush where the bristles are slightly different lengths as you add little paint, then dab it off before painting. I have two comments about chalk paint: 1: it is not a one coat wonder…It is great but works best with several coats thinning each coat a bit until you have a nice finish. 2: One of the joys of chalk painting is that you can use multiple colors on one piece and the by sanding carefully you can bring those first colors to be seen and it is a great effect which then can be waxed. This stuff is seriously fun!!! I like the DIY recipe too! Good luck! (try it out on something small like a flower pot! Hi. I love your idea of making chalk paint. I see most of the ideas here are about decorating. However, I would like to use it as regular chalk paint, in that I can write on it with chalk and erase it. Is this the same concept? Thank you. I have not tried it for a chalk board but I would recommend making a small batch to see how it works. It’s possible that you could even add a little more of the Plaster of Paris to get that look. If I was buying paint I would pick flat but it is not required, although I wouldn’t use anything shinier than satin. I have used Annie Sloan and Maison Blanche wax but once I run out of those I will try Johnson’s minwax. I have heard good stories from it. Congrats on the sewingroom, such fun! Do you have to prep the surface of the furniture? Just wipe it clean! That’s the best advantage to chalk finish paint!! how long will the paint last when put for use later on? Should last as long as you want it to. Be sure the lid is tightly secured. It will thicken slightly but with this paint you can add some water and stir to thin again. Does chalk paint hold up well with a lot of use? For example on kitchen chairs? Thanks! I would say yes! Once the wax hardens it is very durable. I have found that the consistency is different based off of the brand of paint I start with. I would like some more information on the waxing. Are you putting the wax on the whole piece or just in certain areas? How do you apply it? What exactly is the wax doing to the piece? Do you use a dark wax or clear wax? Thank you so much! I love this style and how your furniture looks! I recently painted my kitchen cabinets with a red chalk paint that I made with unsanded grout,and valspar signitire pose red ,distressed and touched with a bit of black. I tried the wax and I don’t like the finish so I went to our local lowes and tried poly acrylic but it had a sheen, sanded the door down them tried rustoleum polyurethane water based matte finish. It came out beautiful but it takes at least 5 coats of it. Do you have any idea what I can use to achieve the matte finish without having to put so many coats on it as it will take me forever to finish. Thanks. Looks great! Did you have any trouble using the primer-based paint? I had read not to, since the binding happens so quickly. I was inadvertently sold the 2 in 1 paint, so I gave it a try. It was a complete disaster, binding quickly and clumping from the start. I’d be interested to know your experience. Thanks! I did not but my sister did recently…I never thought about it binding so fast but I can see that would be a problem. I’m not really sure why I had such good luck with mine but I am very careful to fully mix the plaster of paris and water first so that it is the consistency of skim milk before I pour it into my paint. Maybe that is the key. I’m sure you could find it online but here it is sold in the same section of the store where you would find grout and tile supplies. Maybe that will help. It is in a box and comes about 2lbs per box. Andriana, my German friends have the same problems, so I tried to find out exactly what it is. This is what wikipedia says: “Gypsum plaster, or the plaster of Paris, is produced by heating gypsum to about 300 °F (150 °C)”. Hopefully that helps you to find what you need. Normally this material seems to be used for coating walls or ceilings. Building supply stores should carry it, good luck. I tried making the chalk paint, big failure! It was very thick and when I put it on the streaks were terrible. It was very thick. I added more water and paint. Any suggestions. I love this recipe! I’ve used it on a few projects and it’s turned out so wonderfully. I tell everyone who asks me about painting furniture to consider using this. Thanks so much! Does it matter how you apply this mixture; paint brush, foam brush, roller? Most recipes call for flat paint. Have you ever used the satin, or know why it might not work as well? Just don’t want to waste paint. I don’t actually know the reasoning but it must have to do with the how the powder reacts with the shine. I have not had any issues but I mostly use paint with a primer in one. Not sure if that helps also. Hi , thanks so much for the recipe ! I have used it on lots of pieces and it works great ! I wanted to add , that I have used many types of paint, flat , eggshell and semi , all seem to work great . I usually buy ” oops” paint that people have returned and then depending on color I add the acrylic craft paint from the dollor store . Have such a selection of color this way and works perfectly ! For finishing , I usually use minwax polycrylic since it is non yellowing . There is a learning curve with it and can be very frustrating . So decided to try waxing , I used the minwax wax and it just soaked in – I couldn’t tell if I had put enough on or couldn’t tell if it was buffed . It was a lot of work and didn’t change anything . Should you be able to tell the piece has been waxed ? I called minwax and they said if the paint is flat or chalk it just soaks in and will use up all your wax . Anyone else have this issue with any waxes? Thank you! I just did my first project with chalk paint, it is not turning out as lovely as everyone says. So I thought I’d share what happened and get opinions. I’ve read that one coat works great many times and doesn’t show the brush strokes. Well, I can see the original color through in a lot of places along with the brush “strokes.” I used a dark brown/black, when I rub it with my finger i see white flecks. I am thinking that I didn’t let it dissolve enough before adding the paint or something, what is your opinion. I probably ended up mixing about 1/2 a gallon. I probably should have done a lot less at a time, oops. O was in a hurry, and just not thinking. That’s a lot of pain to waist I wonder if at this point I could get it to mix better if I added more water to my mixture. Ideas would be great!! One thing however, on several DIY sites I’ve noticed the wax finish comment – but here’s the thing; no matter how hard I look online I can’t find why this wax finish is applied nor what kind of wax to use so that I don’t end up with a glossy surface (I’m going for the chalk finish paint to avoid the glossyness). Any answers re: the wax finish would be greatly appreciated!! Chalk paint is very dry, just like chalk or and old fashioned chalk board so it needs to be sealed. Waxing protects the paint as well as gives depth to the paint color. The shine will be determined by how much buffing you do. Minwax makes a clear furniture wax but I have only used Annie Sloan. Have you tried this homemade chalk paint on kitchen cabinets? I just bought a 60’s ranch with the original cabinets. I want to chalk paint them white to brighten up the kitchen. What would be the best way to seal them after? Have you tried this on kitchen cabinets? Just bought a 1960′ s ranch with the original cabinets. I want to paint them white to brighten up the kitchen. What would be the best way to seal them after? You can use this on anything just as you would any chalk type paint. I recently painted mine with a product I love that may work for you as well. Does a homemade chalk paint require a special paint brush like the Annie Sloan line of paints? Not for me 🙂 I use the same paint brush for my latex and chalk paints! Does this recipe distress easily like the Annie Sloan paint? I have oak glass paneled doors that I want a vintage look to them using Behr Ultra one step seal grey and your recipe. It was very easy to mix and went on well (I may add less water g or the other side). I was just starting the distressing step when I noticed that the area’s I was sanding were getting a green hue. I wanted to get areas that were sanded to the original wood and then I was going to use a dark wax. Has this ever happened to you? No, not sure what could be causing the green hue. Possibly the paint color with the oak stain? Have you figured out a solution? I’ve been trying to figure this out. I’ve been painting for 4 years. Whenever I use a black or dark color (dark gray, dark blue), there’s white specks that pop up in the finish. What do you do to correct this? Used this recipe and it worked great!!! One question, did you use the wac to create dimension on top of the lighter paint color, or to protect the finish? We painted a dresser wth black chalk paint…wondering now if we need to wax it. You should always wax chalk paint. For black you can wax with clear. I sometimes use dark wax if I want an antiqued look. The latex paint is a black color?? The color in this post is a gray color. 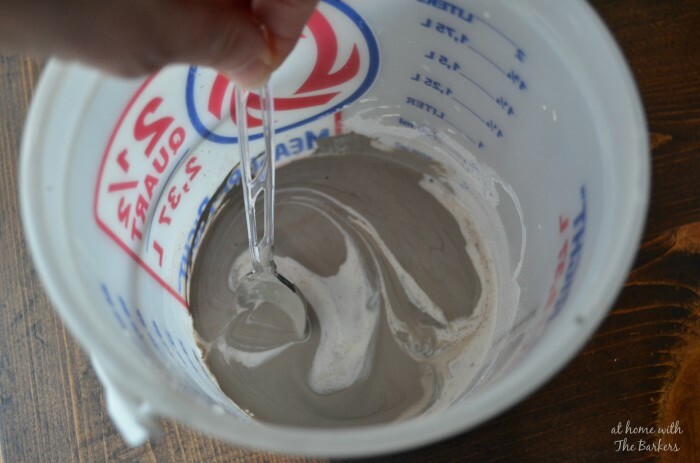 When making your own chalk finish paint you would use the latex color of your choice. I love chalk paint! The advantage to using it is not having to prime or sand. You can literally paint over anything. I’ve even painted it on metal. Annie Sloan Chalk Paint in my opinion is the absolute best but I think DecoArt and Valspar make really great ones too. I can’t wait to try your recipe for homemade chalk paint, because cost effective, but also the colors available in latex paint. I want to use this to paint a plaid love seat rocker. Have you used your recipe on upholstery? ? I make my own chalk paint as well, but I have had trouble with black and navy. It seems with darker colors that white specks show up after the paint dries, which I assume is the plaster of paris. Have you ever had this issue? I use a mixer, so I’m not sure what the issue is! It is very frustrating.